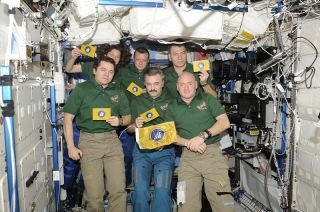 International Astronautical Federation (IAF) flags seen aboard the International Space Station during their first spaceflight with the Soyuz TMA-20 and Expedition 26 crews. Hundreds of small flags that launched into space twice and flew aboard crewed spacecraft from three different countries, as well as two space stations, will be returned to the organization for which they were flown during an international ceremony held in Berlin. On Friday (Sept. 14), astronauts from Europe and China will join officials from their respective space agencies and from the International Astronautical Federation (IAF) for the handover of 300 flags that most recently returned from orbit aboard China's Shenzhou 9 mission in June. The ceremony will take place during the ILA Berlin Air Show at Germany's Berlin Brandenburg Airport. The blue and gold flags, which are unique for having flown on "all types of active manned spacecrafts in the world," traveled in Earth orbit for 444 days over the course of two extended missions. The flags' multi-vehicle journey, which began two years ago, before the United States retired its space shuttle fleet, commemorated the Federation's 60th anniversary. The flags were first launched on Russia's Soyuz TMA-20 spacecraft on Dec. 15, 2010, with Russian cosmonaut Dmitri Kondratyev of Roscosmos, NASA's Cady Coleman and European Space Agency (ESA) astronaut Paolo Nespoli. The three crewmates then brought the flags aboard the International Space Station (ISS), where they remained for five months. The cloth banners then returned to Earth aboard NASA's space shuttle Endeavour, landing on the spacecraft's final mission, STS-134, on June 1, 2011. The same day that the flags are returned to the IAF in Berlin, Endeavour will be mounted to a jumbo jet in Florida for its delivery to Los Angeles and the California Science Center for display. The flags, soon after their first landing from space, were flown on board a French space agency (CNES) organized parabolic flight, which exposed them to lunar and Martian gravity for brief periods, as well as weightlessness. ESA astronaut Jean-Fraçois Clervoy and Romanian astronaut Dumitru-Dorin Prunariu flew and floated with the flags on the Airbus A300 aircraft. The IAF pennants' second journey in space began with the Sept. 29, 2011, liftoff of China's unmanned Tiangong 1 lab module. The flags were packed on the prototype space station, and orbited the Earth unattended while waiting for the arrival of China's fourth piloted capsule and the first to include a female astronaut on the crew, Shenzhou 9. The Shenzhou 9 mission made Chinese history with the docking of the piloted capsule with Tiangong 1. The nearly 13-day flight was another first for the nation's burgeoning human spaceflight program. Liu Wang, who lived on board the Tiangong 1 module with Shenzhou 9's commander Jing Haipeng and China's first woman in space Liu Yang, will attend the Berlin ceremony to present the flown flags back to Feuerbacher. The ceremony will be the flags' last stop before they are distributed to IAF member organizations to thank them for their support of the federation. Their final handover will be during the International Astronautical Congress to be held next month in Naples, Italy. Founded in 1951 to re-establish communications between scientists on both sides of the Cold War, the International Astronautical Federation is now the world's leading space advocacy organization with 226 members in 59 countries, including members in leading agencies, space companies, societies, associations and institutes worldwide.